A lot of what I am stitching at this time of year are Xmas gifts, but I did make my Hubby a little gift to keep his IPad and key board safe. 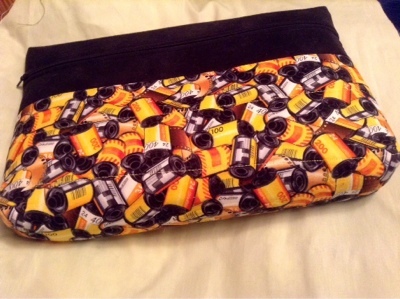 My Hubby loves photography and has quite a few camera's so I could not resist this fabric when I saw it. I used the new Bosal fusible foam, so the case is more sturdy. Great bag for your hubby and a fantastic pattern. You do realise no one under 25 will know what they are?